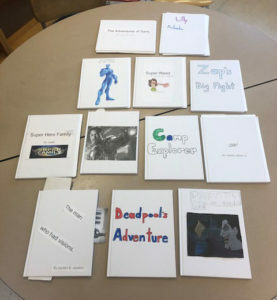 Middle school students harnessed their own special powers in writing to create superhero stories at summer school. They researched superheroes by reading stories and looking through comic books that used onomatopoeia. Then the students created original characters with super powers and wrote stories about them. They completed a brainstorming packet, wrote a rough draft, edited their work, and then created a final copy in the format of a hardcover book with illustrations. Once completed, the students presented their books to the class and received positive feedback. Special thanks to Goff Middle School speech therapist Audry June for her assistance with the project!